Every girl loves herself some animal print, right? I think it adds pizazz to any outfit! I wore this "safari inspired" outfit to a fun little bar in Fullerton, Ca called Heroes Bar & Grill. It was so fun and relaxed, but the coolest part was that the servers give you peanuts before your meal and you just throw the peanut shells on the ground...it definitely created a "relaxed" bar atmosphere. But anyways...can you believe Summer is almost over? I don't know if I'm all that ready to go back to school. But it was bound to happen sometime. What did you all do for Summer this year? beautiful bracelets! and OMG! your hair looks awesome! wow, your hair is AMAZING! your blog's so much fun, too. definitely following. nive outfit, we love it!!! I love the hippie-vibe this outfit puts out :) And that hair! My god :) I am too envious for words. Love your safari look, so stylish!!! wowowowowow. Your hair is so loooovely! The dress is too beautiful and you are very gorgeous in the pics! Cute top! You have such gorgeous hair. I agree, every girl loves some animal print! The dress looks gorgeous on you! Love some animal print! I think it's definitely a neutral and goes with anything! Your arm party with the bracelets is awesome! You look great! And I also love my animal print! You have gorgeous hair. wow this outfit is fabulous, I love it! Love how you paired this skirt with leopard top and mixed the prints! Looks awesome! PS. and your hair is GORGEOUS! you look great! I love your hair color! Great outfit! : ) I love the jewelry and your hair looks beautiful! ps: i'm having a giveaway for a Casio Gold Watch so check it out if you like.. Thanks for your lovely comment and for following us! : ) I love London too, it's a amazing city! Of course we're following you back now! 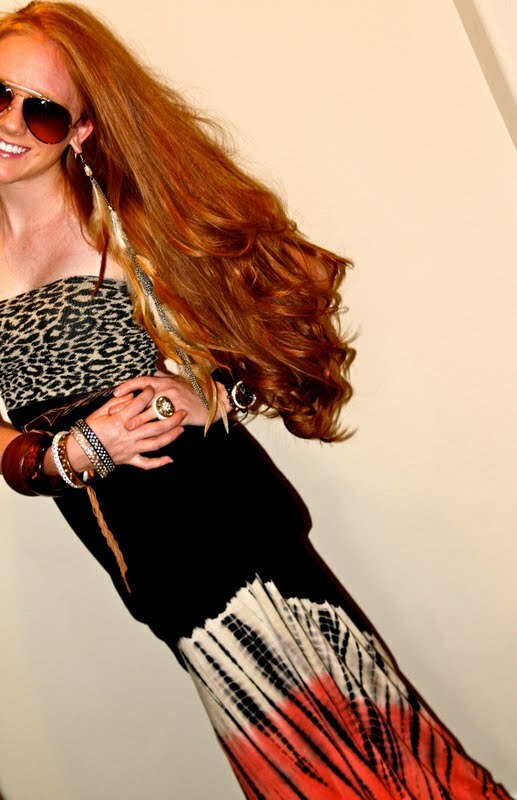 Nice skirt and your hair looks amazing!! a lot of people said it before but your hair is amazing! so so so beautiful! 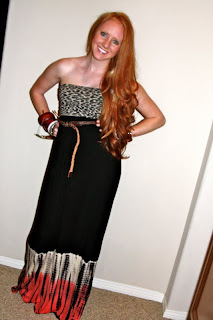 love how you styled this f21 maxi dress :) too cute! WOW ! your hair is amazing!!!!!!! Damn, you hair!!! I like the colours, its curls!!! Very gorgeous,my congrats! I also like so much your style, it's great! love your skirt!!! and your hair for that matter! Great blog! Love these shots...your hair is absolutely AMAZING!! ur hair is so nice and love the safari prints. Would you like we follow each other? i hope so!!! Your hair is totally amazing! You're so beautiful. You look stunning in this outfit. Your HAIR!! I hope you never cut it, its gorgeous. dang girl...you are sassy! love how you layered all of the bangles and bracelets!! the animal print is fun with the colors of the maxi dress!! and i totally love the feathers!! I LOVE LOVE LOVE LOVE LOVE your HAIR!!! Thank you for visiting my blog! I absolutely love your outfit! Great job mixing the patterns together! I´m really like your Blog. you have such amazing hair ! great hair. great outfit. loves! This skirt is so pretty. I love the background of your blog ! 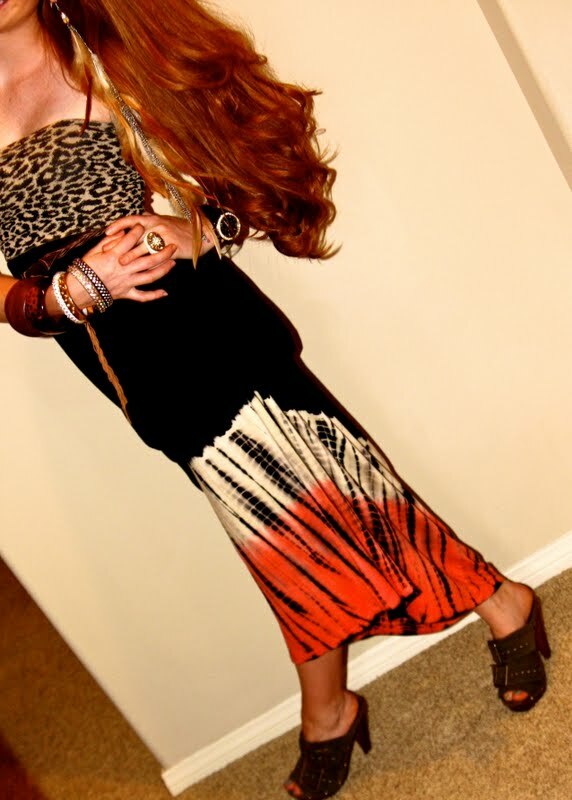 cute outfit and love the maxi skirt =) Would you like to follow each other!